Long live the King! Finally the Crown Prince sits on the throne as King Gyeongjong. After King Sukjong passed away, all the factions could not accept an empty throne nor could the nation live without a king. Rebel Jeong, who was caught by Dae Gil, remains silent and won't tell Dae Gil where he hid the contract with In Jwa. The fact is Jeong also doesn't trust In Jwa. That's why he had a back-up plan to hide the agreement. But where? Yeoning’s distrust drives him to make a bet with Dae Gil during an archery contest. He remembers In Jwa's words, that the point of Dae Gil is to replace Yeoning as king and take the throne. 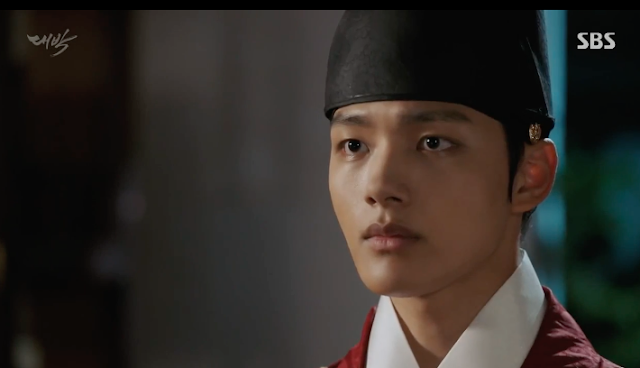 Dae Gil hesitates to defeat his younger brother and Crown Prince, but decides he must win. He does win the bet and so is not only treated to a drink by Yeoning, but also Yeoning must grant his wish. 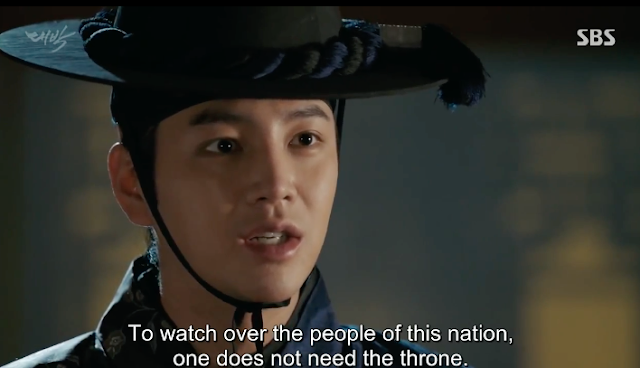 Dae Gil tries to explain that he is not interested in being a king and gaining the throne--he just wants to serve people of the nation. And for his wish, he says to Yeoning, "Trust me. Not for my sake, but for yours.That is my wish." He also promises to show proper respect as Yeoning’s subject. But Yeoning doesn’t answer; he still can't trust Dae Gil. With Jeong in jail, In Jwa sent his people to find it at rebel Jeong's house, but they fail. In Jwa even goes to ask Jeong where he hid it. In Jwa is afraid that Jeong will betray him, but Jeong shows his scarred hand as evidence that he wasn’t lying when he cut his hand for a blood oath. 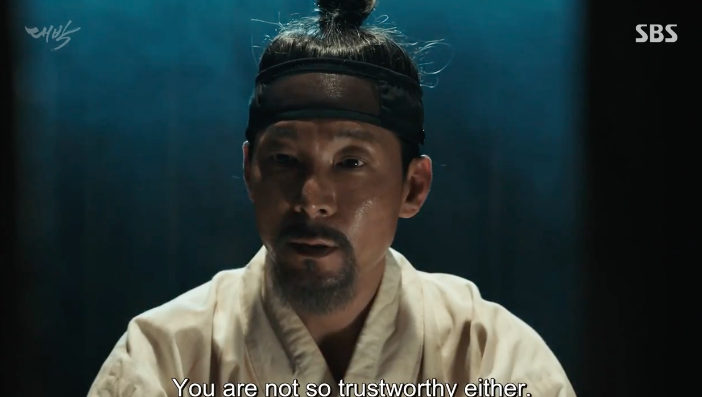 However, the distrust is mutual; Jeong doesn’t trust In Jwa either and refuses to tell him where the blood oath is, saying it’s his lifeline. Dae Gil sends a message, via a prior arrangement, to Man Geum, asking him to collect some information. As a result, some of Man Geum's people follow In Jwa to Hong Mae’s gambling house where he threatens her life. In Jwa’s instinct is right that Hong Mae holds the agreement, but she doesn’t want to give it to In Jwa. He gives her a day to find it and hand it over. All this is reported to Dae Gil as well as instructions where to find Man Geum. 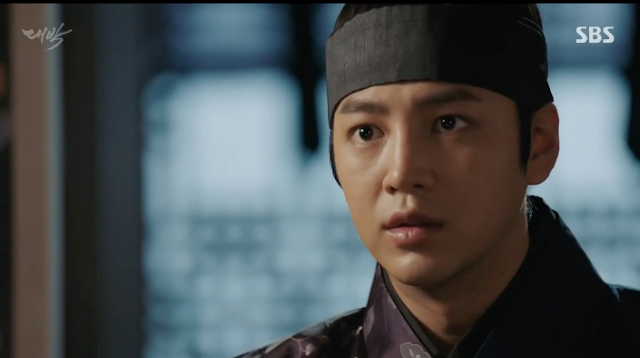 The next day, In Jwa, who now has the run of the palace, comes upon Dae Gil and tells him to prepare to become king. Yeoning arrives in time to witness In Jwa pat Dae Gil on the shoulder. Both pass each other silently as Dae Gil heads off to speak to the King. Dae Gil once again confirms that he is not qualified for a government position as he failed to capture the the leader of the rebellious plot against the Crown: Yi In Jwa. 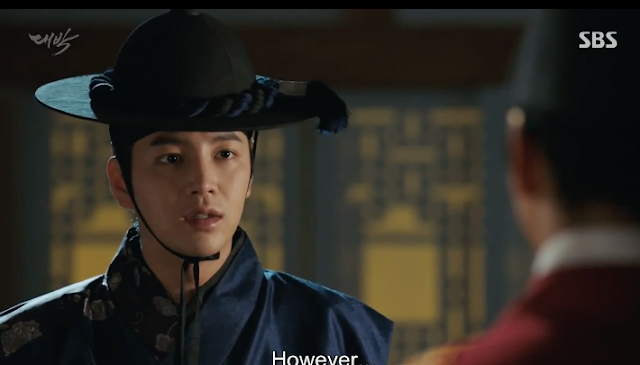 He asks the King to postpone Rebel Jeong’s punishment in order to catch In Jwa with the evidence. 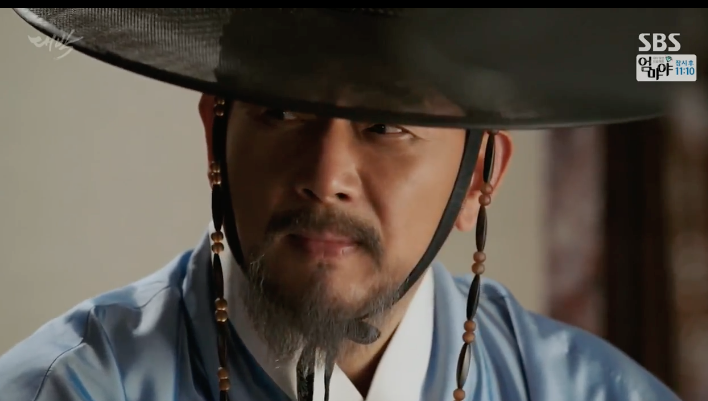 Although he King is impressed by his humility, he tells Dae Gil that he better be right or he’ll pay with his life. Dae Gil accepts the challenge. It seems the King trusts neither Dae Gil nor In Jwa completely. 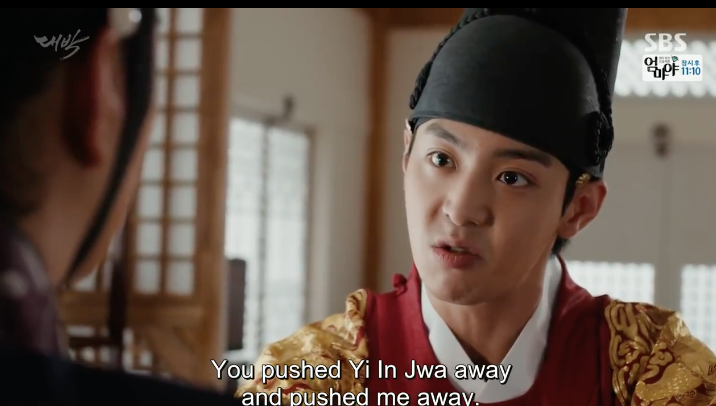 After Dae Gil leaves, the King meets In Jwa who tells him to name Yeoning as Crown Prince, because in doing so he can learn who his foes clearly are. In Jwa, then, enters the Noron meeting room and puts the same idea in their minds. Head Minister remains suspicious of In Jwa’s intentions but finally agrees to go along with the plan to make Yeoning Crown Prince. The King agrees. But when he announces it, the Soron faction disagrees and pleads with the King not to take that step. But that was actually part of In Jwa's plan to make the Soron and Noron factions fight, and, thus, destroy the Norons. The king remains firm, however, and makes Yeoning the Crown Prince. Across town, Moo Myung arrives at Hong Mae’s den at In Jwa’s order to get the agreement and then kill Hong Mae because she turned her back on him when he was in prison. Dae Gil suddenly arrives to stop Moo Myung from killing her. Hong Mae, however, yells at them both as their swords clash and puts the blood soaked paper into a candle flame, burning it up. Both men look stunned and Moo Myung leaves without harming her. 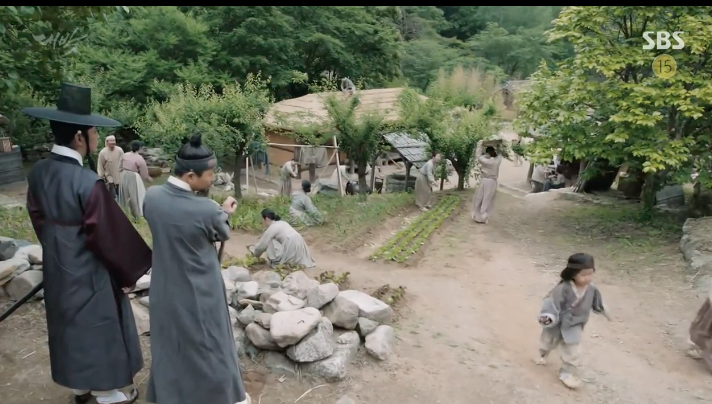 "Lord" Dae Gil goes to meet his father, Man Geum, in a village which is full of people who live there because Dae Gil saved their lives after the country abandoned them. Man Geum explains they are the reason why Dae Gil’s life is not his own anymore. Dae Gil again says he’s not interested in being the king even though he knows he’s of royal blood and tells his father to stop. 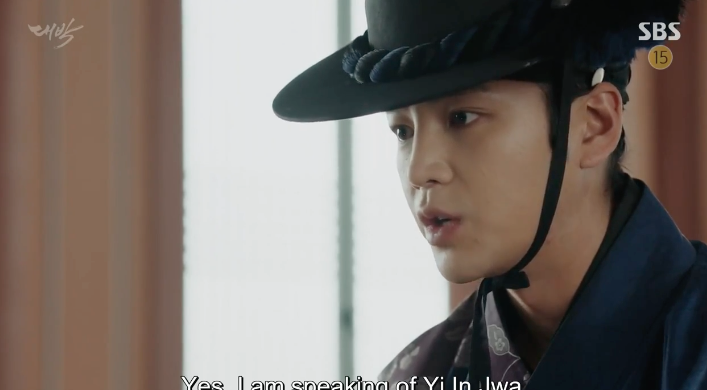 Nevertheless, Man Geum, who has become the head of the merchant’s organization in the eight counties, informs Dae Gil that a man named Park from Honam would probably appear as In Jwa's partner. Man Geun tells him to keep it secret until that man appears in public. At the same time, some of the Noron ministers suggest that the new Crown Prince also be named Regent, but Yeoning and Minister Kim don’t want them to pursue it. They both recognize it is too soon after his being named Crown Prince. Kim tells Yeoning that he will someday sit upon the throne and be a strong king. 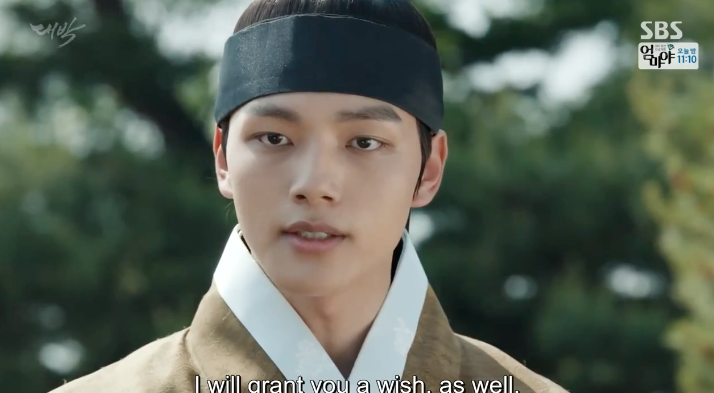 While Yeoning contemplates that idea, Dae Gil comes to congratulate Yeoning, he again assures Yeoning that he will not seek the throne for himself because in order "to watch over the people of this nation, one does not need the throne." Dae Gil promises to do his best, from his position, to protect all the people in the nation. Realizing that this is really what Dae Gil wants, Yeoning agrees to grant his earlier wish and says, "I trust you." Dae Gil smiles at his brother and leaves with a respectful bow, even promising his late mother that he will protect his younger brother. Yeoning finally understands that Dae Gil has chosen his path to protect the people and doesn’t have any intention to be king or to sit on the throne. But he wonders, to himself, what his path is to protect the people. While Yeoning and Dae Gil are occupied in their private meeting, some among the Noron faction, as In Jwa intuited when meeting with the leader of Soron minister, allow their greed for power to overwhelm them. 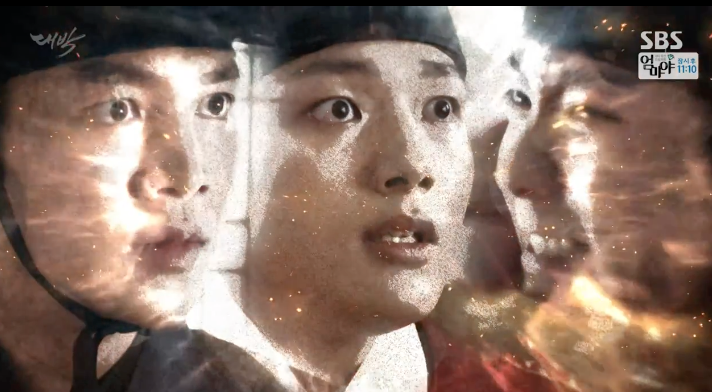 They beg the King to name Yeoning as Crown Prince Regent which causes the King to become extremely angry. Minister Kim learns what they’ve done and scolds them for falling into a trap he believes In Jwa set for them. Yeoning overhears the scolding while on his way to meet the King who summons hims to find out if it was his idea. 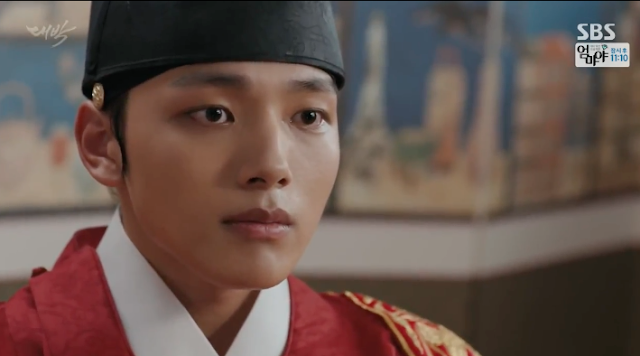 Yeoning replies that it was not, but in defense of the Norons, he says that it is true that the King has no heir of his own. The King becomes even angrier. “What? You dare to hold me in contempt?” At this point, the King is convinced Yeoning wants the throne. Back at Dae Gil’s home, the family meet to discuss events, only to have Hong Mae interrupt. Earlier, he visited Hong Mae and convinced her to to hand over the agreement to help catch In Jwa. In the end, she hid the real paper to give to Dae Gil, burning a fake. She decided to trust Dae Gil because he told her that In Jwa would probably kill her. And that’s true. Given the high intensity of things at the palace, Kim Chae Geun, later, tells Dae Gil to visit the King right away to show him the blood oath and give his evidence against In Jwa. Both believe that the unrest in the palace is a result of In Jwa’s conjuring. Meanwhile, In Jwa meets with the Soron faction where he enlightens them on the on his plan to bring down the Norons and Yeoning. 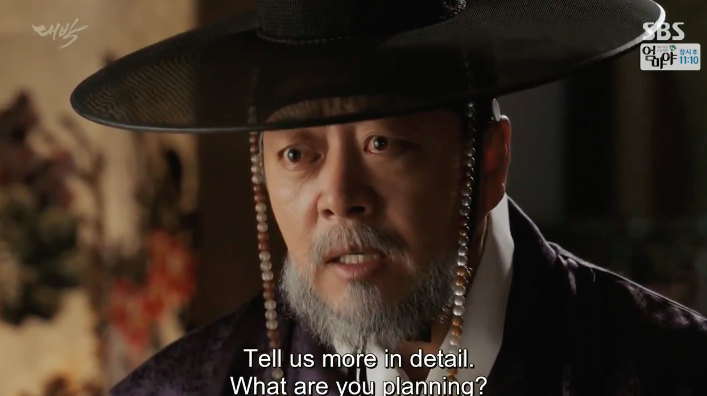 Having set his plan in motion, he introduces them to a government official who claims to be a Noron but will testify to the King that that the Norons plan to kill him...and that Yeoning is part of the plot. That night, the King wakes from a fitful sleep to see a suspicious shadow outside his room, drawing a sword. Upon calling his guards, the shadow disappears. The next morning, when poison is discovered in the King's porridge, the King misunderstands and suspects the Norons and Yeoning did it. Minister Kim tells Yeoning it would be best not to meet King at that moment. Dae Gil, upon learning of the events rushes off to speak to the King but is denied a meeting, meets privately with Minister Kim. He explains that he thinks In Jwa is behind everything. Chang Jib does not deny that he may be right but because there is no evidence yet, he has to wait. 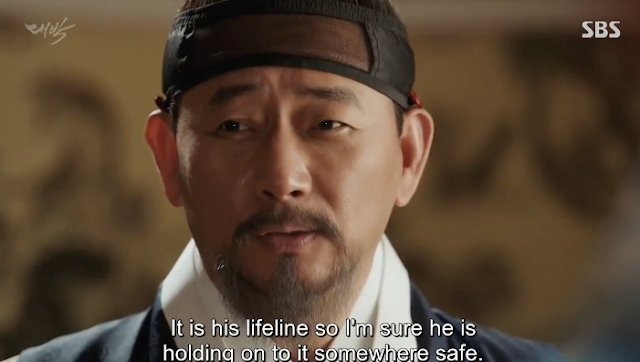 Furthermore, he tells Dae Gil that the Noron faction will protect Yeoning and for him to back off. His protection services are not needed. Following In Jwa’s plan, the Sorons also provoke the King further by spreading the rumor that the late King’s will sought to have Yeoning replace him as king. When the head of the Soron faction and the supposedly defecting Noron go to the King to report the Norons are behind the rumor and that Yeoning is among those traitors, the King becomes violently angry. Grabbing up his sword, he marches to Yeoning’s rooms. Dae Gil sees the King heading towards Yeoning’s residence and tries to stop him. 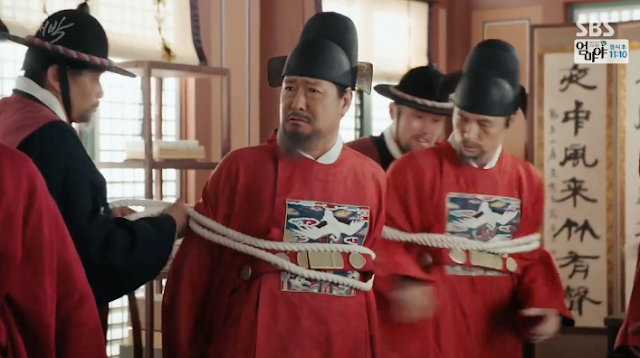 At the same time all the Noron ministers are arrested, Kim Chae Gun interrupts In Jwa’s order to have Dae Gil arrested and, overriding In Jwa’s orders, tells Dae Gil to hurry to the King. 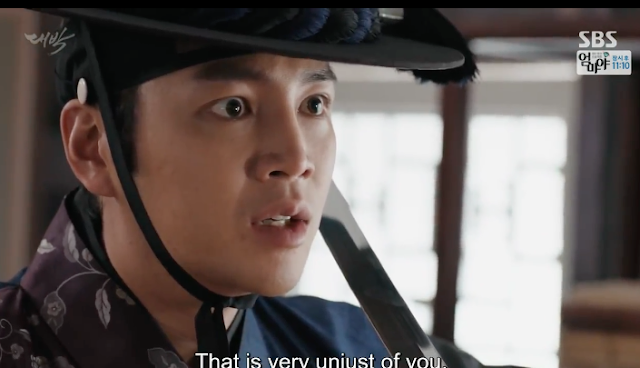 In Jwa vows revenge against Kim Chae Gun after Dae Gil runs off. Meanwhile, the King angrily arrives at Yeoning’s residence and points his blade at Yeoning, telling him to admit to wanting to take the throne. If he admits being part of part of a treasonous plot to usurp the throne, he says he can kill Yeoning with a clear conscience. Yeoning, meanwhile, is stunned by his brother’s accusation. With the King’s sword pointed at him, he confusedly denies knowing what the King is talking about. The King, however, is too angry to listen and raises his sword to kill his brother, but Dae Gil arrives to save Yeoning. He begs the King not to kill Yeoning, but the King ignores him and suddenly throws himself in front of Yeoning as the blade descends. The blade stops inches from Dae Gil’s neck. Dae Gil once again pleads with the King, saying that to kill Yeoning the King will have to kill him first. 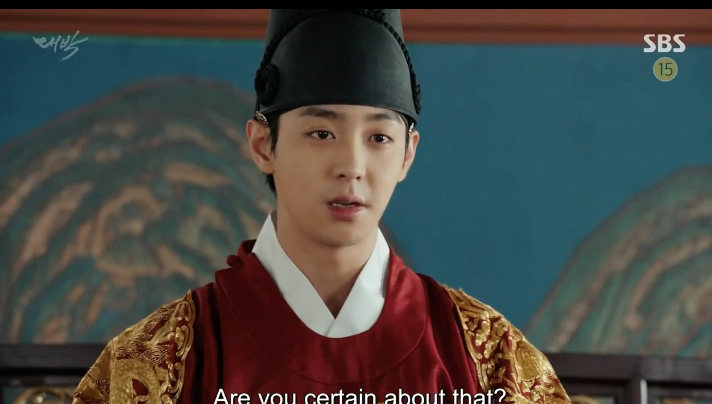 After telling them that he knows they are all three brothers and asking if Dae Gil, too, is part of the treasonous plot to oust him as king, the King angrily pushes Dae Gil aside. As his rage explodes, the King once again swings his sword at the defenceless Yeoning. Will it strike Yeoning or Dae Gil? What will happen next? 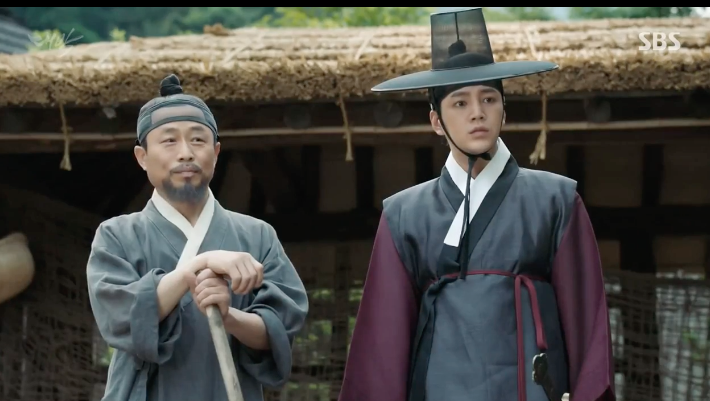 How will Yeoning and Dae Gil survive the King’s anger? Please look forward to episode 21. Thank you for the recap, TEFT team! Now I can see the main theme in this episode as you said sis, trust. Especially when politics are around.